Rice University graduate student Sruthi Radhakrishnan shows samples of pure hexagonal boron nitride and fluorinated hexagonal boron nitride. Photo: Jeff Fitlow/Rice University. A little fluorine turns an insulating ceramic known as white graphene into a wide-bandgap semiconductor with magnetic properties. According to scientists at Rice University, this could make the unique material suitable for electronics in extreme environments. In a proof-of-concept paper in Science Advances, the Rice researchers demonstrate a way to turn two-dimensional (2D) hexagonal boron nitride (h-BN) – also known as white graphene – from an insulator to a semiconductor. The magnetism, they said, is an unexpected bonus. "Boron nitride is a stable insulator and commercially very useful as a protective coating, even in cosmetics, because it absorbs ultraviolet light," said Rice materials scientist Pulickel Ajayan, whose lab led the study. "There has been a lot of effort to try to modify its electronic structure, but we didn't think it could become both a semiconductor and a magnetic material. So this is something quite different; nobody has seen this kind of behavior in boron nitride before." "We saw that the gap decreases at about 5% fluorination," said Rice postdoctoral researcher and co-author Chandra Sekhar Tiwary. The gap gets smaller with additional fluorination, but only to a point. "Controlling the precise fluorination is something we need to work on. We can get ranges but we don't have perfect control yet. Because the material is atomically thin, one atom less or more changes quite a bit. In the next set of experiments, we want to learn to tune it precisely, atom by atom." The researchers determined that the tension applied by invading fluorine atoms altered the ‘spin’ of electrons in the nitrogen atoms and affected their magnetic moments, the ghostly quality that determines how an atom will respond to a magnetic field. 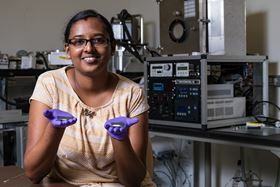 "We see angle-oriented spins, which are very unconventional for 2D materials," said Rice graduate student and lead author Sruthi Radhakrishnan. Rather than aligning to form ferromagnets or canceling each other out, the spins are randomly angled, giving the flat material random pockets of net magnetism. These ferromagnet or anti-ferromagnet pockets can exist in the same swatch of h-BN, which makes them ‘frustrated magnets’ with competing domains. The researchers said their simple, scalable method can potentially be applied to other 2D materials. "Making new materials through nanoengineering is exactly what our group is about," Ajayan said. By mixing and matching different materials, researchers have created a window coating that can prevent excessive heating and generate electricity.